This challenge has been a nice change of pace for me. After the chaos, noise and excitement of the holiday season, then my 8 year-old son's Harry Potter birthday party (10 kids with magic wands and cardboard brooms running around the house! LOL), I was ready to fly away to a tropical island. Sue's challenge is almost as fun as running away - and less expensive. Yesterday I spend a lovely hour or so daydreaming about the different places I've been, either alone or with family. 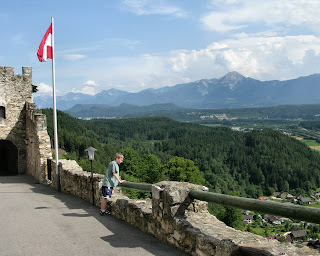 How crisp and clean the air was in Villach, Austria. The smell of green grass and fruit trees. It gets a bit chilly as you hike up the mountain but not unpleasantly cold. Like wading in fresh running water. You can see for miles from nearby Burgruine Landskron castle. In Venice, the air was much different - heavy with humidity and the smell of food, boat motors and canal water. Hot stones under our feet that suddenly turned 10 degrees cooler in the shade. Piazza St Marco echoing with voices, in all different languages. People taking pictures, feeding pigeons, buying souvenirs, laughing and calling to each other across the square. Croatia’s coastline fills my senses – the smell of fresh baked bread and salt water, the sound of people arguing politics over tiny cups of very strong coffee. It seems like there are as many sailboats as cars – their white sails and colorful hulls are like confetti on the turquoise sea. Most of my trips have been during summer time, so it was especially nice to “visit” them while back here in Connecticut the temperature is hovering around freezing. I'm not sure where I'll take my Viewpoints9 challenge, but so far I’m enjoying the journey in my mind.